Do you feel you aren’t living the BEST version of yourself? I do, often. I made a list of 18 things to accomplish this year, 18 for 2018. May seem excessive, some are simple/easy, I have been chipping away with positive results. The results- I am showing up better in my life, but still not my BEST self. I often get caught up comparing myself to others, which takes me down a negative path of self destruction. This month I am letting that go. All I can control is ME and being the best version of ME!! March I will RESTART. The best version of me has Balance. 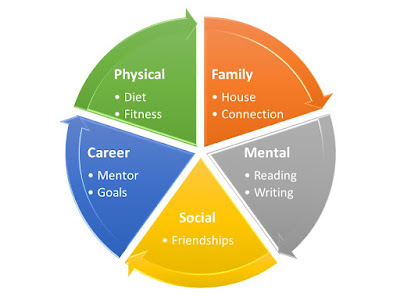 When I was in life coaching class we talked about our personal balance wheel. Your wheel is where you spend your time and effort each day- Family, Career, Health, Spiritual, Financial, Social, etc… You can’t give 100% to everything, you will be depleted. Over time your priorities or areas of focus will shift depending on which parts of your wheel need more attention. Do a quick Google on “Life Balance Wheel” and you will get more information than you will need. I did a quick swag for my March RESTART balance wheel. Each piece of the pie has key actions I will accomplish this month. It is exciting to have a map like this to reference on my journey. Maintaining balance will be key for me. 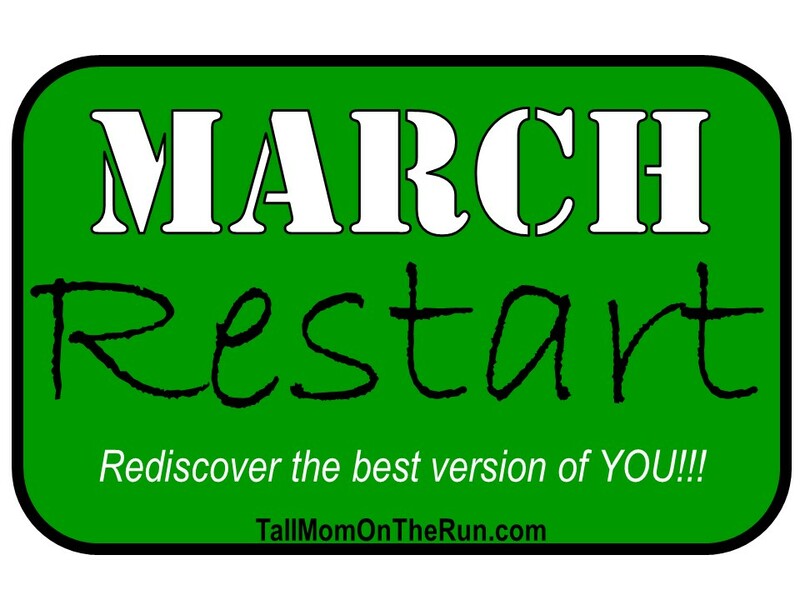 Do you remember my bloggy buddy Kerrie, formerly Mom Vs. Marathon, now DISfitlife? She and her husband Jamey are hosting a FREE #MetabolicMadness challenge starting on March 5th. They will provide targeted workouts for the Fitness portion of my wheel. I joined the gym at my work, I start Yoga for the first time tomorrow at 5:15 am. I will take Yoga class every Friday this month. If you want to kick up your workouts another buddy of mine Blond Ponytail also has free workouts in March!! By connection I mean targeted 1:1 time with my husband and children. This will be the FUN part of my month. Date night with hubby. Taking Kiddo #1 to basketball tournaments, solo, just him and me. Taking Kiddo #2 to a private swim lesson. And special Kindergarten fun times with Kiddo #3. I also want to pull away from the screen more in the evenings, as I have developed a BAD habit of getting eaten by the couch monster. As the month progresses I will check in on how I am doing, what is working, what I learn, struggles, etc. I would love your comments and thoughts as well. 1- Any tips for my first Yoga class tomorrow?? HELP!! 2- What are your focusing on in 2018? How is it going? 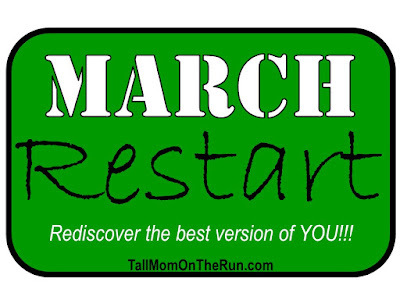 3- Anything you plan to RESTART in March? Go Rediscover the BEST version of YOU!! You will like what you discover. تتشرف شركة تنظيف موكيت بالخرج وتتقدم شركتنا بخدماتها مع فريق من المتخصصين والخبراء فى تنظيف وصيانه وكل مايتعلق بها من اعمال التنظيف ومكافحة الحشرات. Hey lady! So good to see you here again! Hope your yoga class went well! I find that I am 100% a morning runner, but yoga I can do any time of the day, kind of depends on what I'm hoping to get out of it. I'm not that great, but I love how it makes me feel "lighter" and a bit less stressed. My only advice: don't judge yourself, do what feels good to you, and relax. nice blog post you shared. Nice experience! I will inspire lots of moms for sure hehe thanks for sharing your own experience! Maybe sometime I will share mine! More helpful info here! تعتبر شركة ركن كلين من اولى الشركة التى له اسما فى مجال خدمات التنظيف بالرياض شركة تنظيف سجاد بالرياضنحن لدينا احدث المعدات لجلى وتلميع السرميك وافضل المنظفات التى تستخدم فى مجال التنظيف الشامل بالرياض ، اذ كانت تبحث عنشركة تنظيف كنب بالرياض له اسما عريق ولديها الخبره فى التنظيف عليك الاتصال على شركة ركن كلين . Everything that we attempt for is to make importance throughout everyday life. In spite of the fact that it very well may be called a correct science, you definitely will concur, it has any kind of effect by they way you treat yourself and your life once you turn out to be clear what meaning you expect to make throughout everyday life. Take in a couple of ways you can make meaning. I find https://www.avondaletow.com/surprise-towing-service.html this very good helpful site. You can visit this site. nice ... thanks for sharing beautiful post about faimly...i really enjoy your article. Get the list of best and verified packers and movers in Pune. 4mp is an online portal in which you can get detailed information about best movers and packers in Pune. Get free quotes from the top class relocation service provider in Pune.